Warm weather and sandy beaches mean that dads are in for a very busy day with the kids. 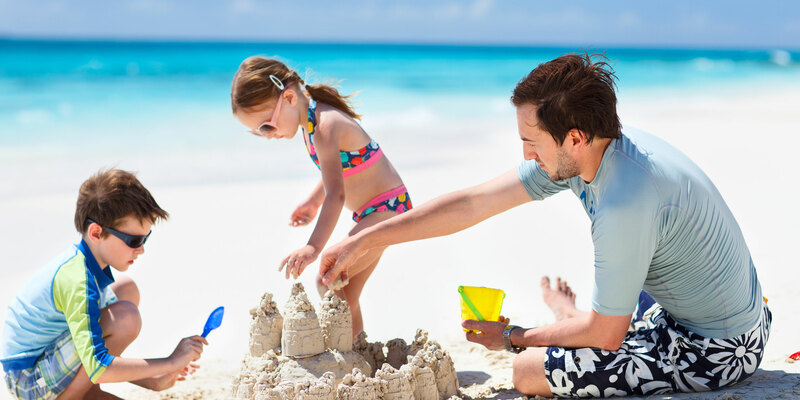 While singles and young couples are lounging on beach towels and in cabanas, we know that dads are busy building sand castles, playing football, throwing kids into the air and snorkeling to see schools of fish with their little ones. There is no end to the activities when you are spending a day at the beach with your kids, which is why we’ve created the perfect beach wardrobe for dads. From board shorts and swim trunks, right on down to those flip flops that will protect his feet from the hot sand, we’ve got him covered. We want dads to look good, and stay protected from the sun, but also have fun without worrying about a wardrobe malfunction. After all, dads should always be concentrating on their kids’ safety when at the beach and nothing else, right? Gone are the days when board shorts and swim trucks only came in solid colors. Quiksilver offers several different styles that cater to every taste and hold up so you can make sand castles, boogie board and snorkel for hours with the kids. Their water repellent hydrophobic treatment helps suits dry out quickly between adventures. And the drawstring closure in front keeps those shorts on when waves (and toddlers) try to take them down. Keep in mind that Quicksilver makes a children’s line, too, so chances are, dad can match the boys this summer! After board shorts, the next most important item to wear at the beach is your rash guard swim shirt. You do want a rash guard to be somewhat fitted so it protects you on that boogie board and surf board. You also don’t want it to start floating up as you bob in the waves or at the pool with the kids. The point of a rash guard is to protect your skin from the harmful rays of the sun, as well as any sand and other abrasive materials you may hit if you’re out surfing for hours on end. Quiksilver Men’s Rash guards come in long sleeve and short sleeve, depending on the level of protection you need. Each fits snug, features UPF 50+ sun protection and is comfortable and easy to get on and off, even when wet. Baseball caps have long been a staple at the beach. For those who love the classic cap or trucker hat look, but might not have a favorite team, there are loads of designs out there to fit every interest. National parks, mountains and creatures of every shape and size are adorning the fronts of caps celebrating the great outdoors by our favorite designers—Black Lantern. Now, we know not all dads can or want to pull off that sporty look though. When you want to protect your head, but wear a different sort of hat, you can reach for the classic straw Fedora. The SiggiHat Fedora is foldable and packable, making it perfect for any beach vacation. Best of all, your partner can steal it and look just as good. Your skin isn’t the only body part that can get sunburned during a day at the beach. Protect your eyes with either the classic Aviator look or the Woodies Polarized sunglasses. Aviators are the go-to style that look good on almost anyone. WOODIES are a newer take on the classic wayfarer design. The real wood finish gives it a more holistic feel as you go out into nature to explore with kids in tow. Ladies may be familiar with the Sanuk Flip Flop line, but men will be eager to throw their arches into the yoga-mat footbed as well. A rubber sole gives a nice grip as you go from the hot parking lot to the burning sand. The thong-style flip flop makes it easy to throw off your shoes and start playing without extra time wasted on straps. This flip flop comes in variety of color combos that work with most swim shorts. Every dad knows that he’ll be hauling stuff to the beach and back, and chances are, he will have to carry a kid, too. The MIER cooler bag will keep his hands free as he carries lunches and drinks for everyone to enjoy throughout the day. The inner insulation and leakproof PEVA liner work together to keep things cold or hot for hours throughout the day. Best of all, this pack can hold 24 cans, which is quite a lot of space for sandwiches and juice boxes. Outer pockets give quick access to napkins and utensils, as well as any trash that might get thrown at dad as kids rush back to play in the water. Keryn Means lives in the suburbs of Washington, D.C. with her husband, two boys and one fluffy little pup. 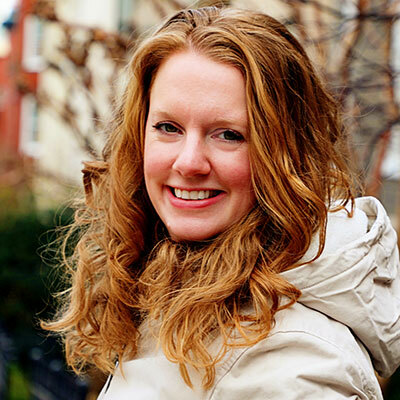 She is an award-winning travel journalist with bylines on Thrillist.com, Travel Age West and more, and loves to talk travel on ABC’s Good Morning Washington. You can find Keryn dragging her two boys around the DC area most days and across the globe several times a year. Follow along on their adventures on WalkingOnTravels.com and on Instagram.